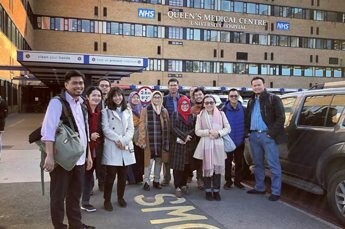 The University of Nottingham has delivered its very first Precision Medicine-Magnetic Resonance Imaging (MRI) short course to a 13 strong cohort from Indonesia across a wide range of institutions. As part of the broader Indonesia initiative, this 3-week programme cross disciplinary CPD course was delivered in collaboration with Indonesia Doctoral Training Partnership (IDTP) by the Faculty of Medicine and Health Science as well as the Faculty of Engineering with an aim to enhance Indonesian’s research and teaching capability in MRI. Multidisciplinary usage of MRI was key in this course, with a particular focus on the fundamental impact and application of imaging techniques in Medicine and Engineering. Participants learned the many facets of MRI: from its basics and capabilities, applications in Neurology, Pharmacy and Engineering, to its future potential for Precision Medicine. Students also took part in a live demonstration of functional MRI of the brain and had a rare opportunity to visit some of the most advanced MRI systems and research laboratories at the University. Supported by the Ministry of Research, Technology and Higher Education in Indonesia (RISTEKDIKTI), the course highlights the Indonesian government’s desire to upskill academic leaders as well as investing in MRI training which has a long-term benefit on improving the quality of life for patients. This group of exceptional senior and mid-career academic leaders from all across Indonesia, from a range of disciplines including Medicine, Engineering, Agriculture, Physics and Sciences, participated through a combination of lectures, case study presentations, group discussions and individual reflections. The students were supported throughout the course by a group of experts, giving them concreate tools to apply in teaching and research back in Indonesia. Reflection on this pioneering training course, Jason Feehily, Director of Knowledge Exchange Asia and CPD Services said: I have been hugely impressed with the attitude and enthusiasm of this CPD cohort and it was wonderful to demonstrate to them our Beacon and the capabilities of MRI. CPD is an excellent way of developing institutional relationships to create further opportunities to collaborate.